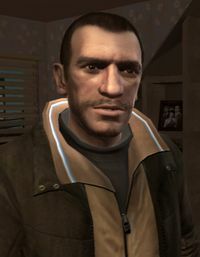 Niko Bellic (Croatian: Niko Belić) (Serbian: Нико Белић) is the playable character type::protagonist of appearance::Grand Theft Auto IV. Born 1978 in Yugoslavia, he worked as a soldier in the Yugoslav Wars during adolescence; as a young man he worked as a smuggler across the Adriatic Sea. In 2008, he moved to Liberty City to get rich with his cousin Roman, but instead ended up involved in a life of crime. Work was hard to come by following the war. 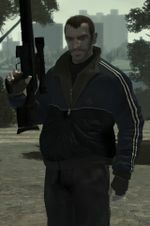 In 1998 Niko's cousin, Roman had already moved to America to start a new life in Liberty City. Niko tells Kate McReary that after Roman left Yugoslavia, Roman's mother was raped and murdered but to spare Roman further devastation, he told him she died in a house fire. 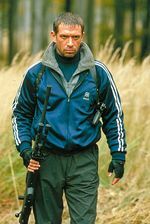 Niko did at least one prison stint in Europe (that was definitely not for his war crimes as Niko would either be in prison for life or executed) , then worked as a human trafficker for Ray Bulgarin. During a smuggling run from Yugoslavia to Italy the boat sank in the Adriatic, Niko swam to safety, but everything and everyone else was lost. Bulgarin believed that Niko had intentionally scuttled the ship and stole his money; the gangster's reach was too great within Europe, so Niko joined the merchant navy to escape Bulgarin's influence. It is unknown what happens to Niko after the events of Grand Theft Auto IV, however it can be assumed that after the Revenge ending Niko stays in Liberty City as Roman and his new family are pretty much all he has. As most of the people who would want to kill Niko are dead anyway, he wouldn't feel as if he needs to look over his shoulder anymore. 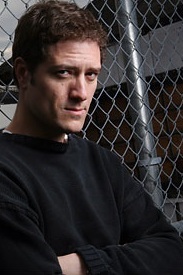 Even Ray Bulgarin had been recently killed elsewhere by Luis Lopez unbeknownst to Niko. It should be noted that coming up to the end of the game, Niko reveals to Kate McReary that he doesn't want to live the crime life anymore, so it is possible he may have ceased and cut all of his criminal ties. Meanwhile in the Deal ending, Niko tells Mallorie that "Your child will never worry about anything", suggesting he would have taken care of his dead cousin's child. Niko also mentions to Phil Bell that he is leaving the criminal life. It has been comfirmed that Niko will not appear in Grand Theft Auto V, however other characters from Grand Theft Auto IV apparently will.